It was a spellbinding day for two St John’s College students as they were the first North Island team to take out two of six national excellence awards for the Young Enterprise Scheme (YES). On Waitangi Day Benjamin Gardiner and Brad Selwood attended a reception at Government House to honour their achievements. The invitation was made to recognise the national achievement of St John’s College in social enterprise – as the college was a national finalist in the NZI National Business Sustainability Awards in 2018. They were awarded for their device, otherwise known as GEORGE – a low-cost rain and flood warning device. 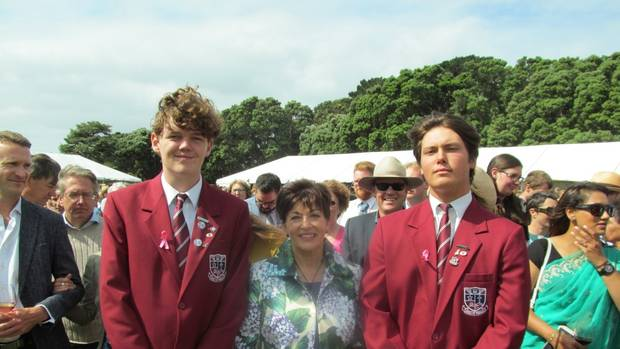 Photo: St John’s College student Brad Selwood, Governor General Patsy Reddy and Ben Gardiner.